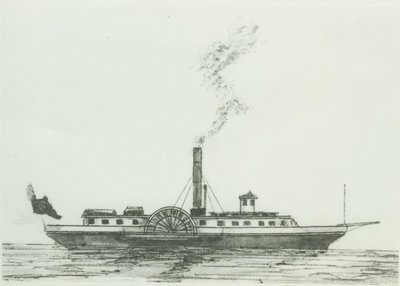 Niagara Harbour & Dock Co.
27.75" X 72" engine. 17'6" diameter, wheels. 1838, Apr 21 - 1839, Jul 22 Chartered by the Canadian Government as a naval gunboat. 1838, Nov 13 Transported troops to Prescott, ONT, at the "Battle of the Windmill". 1839, May 8 Released from naval service & sold by Capt. Lockhart to Hugh Richardson, Toronto, ONT. 1841, Apr Nearly destroyed when the steamer BURLINGTON burned to water's edge at wharf in Toronto. 1847, Jul 8 Caught in a riot at Oswego, NY; was taken, anchors dropped & colors pulled down, crew flogged.